The RAMA Flex is designed with characteristic AirDesign attention to detail: Streamlined risers with no split A’s and the wing tip steering toggle, neatly tucked out of the way. The neoprene covering on the adjustable brake handles add a level of comfort and fit for pilots having to manage flying with gloves and throttle in hand. The dual pulley system allows for low and high attachment points. With trim tabs released the glider transitions to a semi reflex profile which increases speed and wing pressurization as the wing’s center of gravity shifts forward. This shift inherently makes the glider more stable. Careful attention to minimizing any roll and pitch tendencies during flight allows the pilot to enjoy a calm, controlled flight even in rougher weather conditions. • I flew the RamaFlex this morning. What a great wing! You've got a winner here! Even before hooking up to the trike, I could tell it was light and well built. Quick and easy inflation and the wing tip steering is very maneuverable! Love it! • I am VERY impressed! I have not been able to do no wind forwards for several years. These 76.5 year old legs just couldn't hack it anymore. 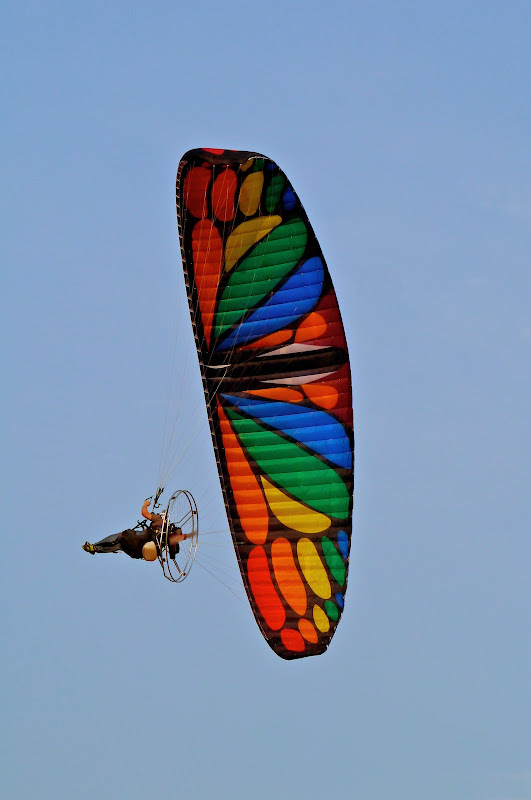 The vendor hype says "remarkably easy to forward and reverse launch in nil wind conditions". OK, let's see about that. On 1st & 2nd launches wind was about 2 mph. I did successful reverses! Flew in both reflex & normal, steering with wing tip & then brake toggles. In reflex it steers much better with wing tip steering. Brake toggles very effective in normal trim. The landing was equally amazing! I thought "there's no way I can run that fast on landing" I came in “hot" hands up, and was really moving. I pulled down on the brakes about 10cm. The wing leveled off, slowed down & when I buried them I touched down in a medium speed run out. I couldn't believe it so I did it again with the same results. Man, what a wing! I never thought I would ever want to own a full reflex wing. You can design your own glider using our custom colour picker. Stand out from the gaggle with your own colour combination. To get a quote and estimated delivery time for your custom colour simply copy and email the linkof the colourpicker to your local distributor. Butterfly colour scheme is also available!